Optical Cleaning Kit consists of reagent-grade isopropyl alcohol. Optical Cleaning Kit consists of 24 cotton balls, 24 lens matts, 24 surgical-grade finger cots, distilled water, polishing compound and an air bulb to remove dust. Unit is suitable for cleaning lens. Ideal for private labeling to manufacturers and distributors of lasers and cameras, product is designed to remove splatter and blow-back in CO₂ lasers. An advanced optical cleaning kit is now being offered for private labeling to manufacturers and distributors of lasers, cameras, and other types of vision systems by Laser Research Optics of Providence, Rhode Island. The Advanced Optical Cleaning Kit was developed by Meller Optics, Inc. to help customers remove splatter and blow-back in the field from their CO₂ lasers and extend their working life. Featuring complete step-by-step instructions and everything necessary to prevent damage to coatings and help improve transmission, the kits are ideal for cleaning any type of lens. Private labeling includes the standard package and all contents. Available in 100 kit minimum quantities, Private Labeled Advanced Optical Cleaning Kits are fully assembled and include: 24 cotton balls, 24 lens matts, 24 surgical-grade finger cots, distilled water, polishing compound, reagent-grade isopropyl alcohol and acetone, and an air bulb to remove dust. 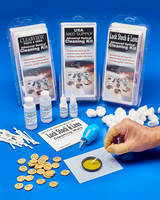 Private Labeled Advanced Optical Cleaning Kits are priced at $25.95 ea. in 100 quantity; with minor setup fee, depending upon labeling requirements. Higher quantity discounts are offered.